Sometimes I really need to smoke A full cigar when I really don’t have a time or late at night or I’m very tired after work. Petit corona was maid for that purpose I guess, a quick dose of nicotine that has a full cigar experience. 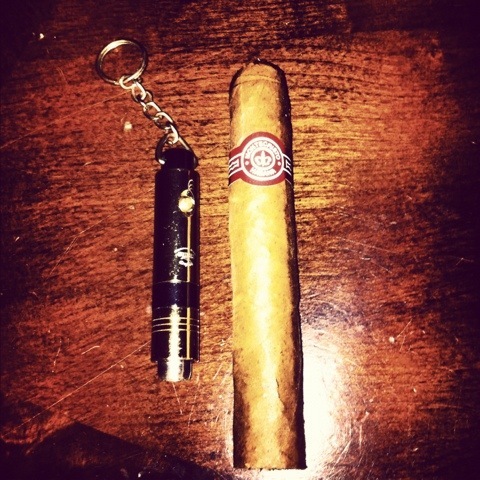 When it is in this point Montecristo No.5 appears. It is a cigar that has everything Montecristo , flavors, aromas and quality. This little guy starts off with a very nice woodsy nutty mild to medium smoke, quickly turn to a strength medium adding more sweet tobacco and pepper. The smoke gets really flavorful toward the midway point when cocoa, coffee and earthiness join the blend of aromas. If you have 30 minutes or so and you really want to make them special grab one of those little cigars, this is for you. Sounds like a great short smoke. How does it compare to the No. 4?